4 bederoom, 2 1/2 bath renovated lakefront home. 250 feet of private beach. Oyster Haven is a renovated circa 1830 farmhouse that combines vintage charm with all the modern conveniences, including a state-of-the-art gourmet kitchen with two ovens and an enormous central island perfect for large family gatherings. Located on the shore of Lake Champlain, this immaculate and comfortable vacation home boasts an acre and a half of property that includes a deck, a large patio with a fire pit, and a grassy yard that stretches down to a private beach. With 250 feet of lake frontage, a dock, two kayaks, a canoe, a stand-up paddle board, and a mooring for those who wish to bring or rent a motorboat or sailboat, guests can find a whole host of outdoor activities without ever leaving the back yard. Located very close to the Adirondack Mountains, enjoy hiking in the summer and outstanding skiing on Whiteface Mountain in the winter. The Fall also provides for breathtaking leaf turning color! So much history in the area, with museums featuring the Revolutionary War and War of 1812. The portion of the lake off our back yard was the site of the Battle of Valcour of the Revolutionary War! Attractions nearby include Ausable Chasm with rafting (even white water), tours, and even rock climbing. The area has a winery tour and a current explosion of craft breweries to visit. We have a connection with The Valcour Brewing Company located in The Old Stone Barracks on the old Plattsburgh Air Force Base. For those planning a wedding in the area, we are located right next door to the Valcour Conference Center which hosts year round weddings and receptions. Our home is a short walk to this venue and perfect for housing out of town wedding guests. We're Tim & Laura Pearl. We grew up in Plattsburgh, NY, were high school sweethearts and have been married for 35 years. We have raised 5 sons and currently have 7 grandchildren. Tim: I graduated from the University of Notre Dame in 1980, then spent 8 years in the Navy as a Naval Aviator flying A-7's and F/A-18's. I am now a commercial airline pilot for Delta Air Lines and have been for 28 years. I grew up right up the road on Lake Champlain and love the idea of introducing you to this magical area. Laura: I graduated from The College of the Holy Cross in Worcester, MA in 1980. I spent the majority of our married years raising our 5 sons. When our youngest son started high school, I began a lifelong dream to write a novel. In 2012, I had my first young adult novel, "Finding Grace" published by Bezalel Books. I then wrote another YA novel, "Erin's Ring", which was published in 2014. We now spend most of our time travelling to visit our 5 sons and 7 grandchildren. This area is our hometown. We grew up here and have wonderful memories. We always thought it was the perfect place to grow up; with the lake right here, the mountains close by, a small town feel, with a big city (Montreal) very close as well. We've been living away from here for awhile, but can't keep ourselves away too long. We are thrilled to be able to share our home and this area with you. We know you'll love it as much as we do. Although the house is a lovely, renovated colonial, the thing that made us fall in love with it was the view of the lake, the islands, and the mountains of Vermont in the background. Growing up on the lake makes you a little spoiled. I've always wanted to get back. I could sit and stare for hours at the beautiful scenery right out our back yard. Kitchen is fully appointed, with plenty of dishes and silverware to handle a big crowd. Cooks will find all the pots and pans and utensils necessary for meal prep. Another amazing stay on a Lake Champlain! Our host, Tim Pearl is so incredibly responsive and wonderful to work with. His communication is excellent and the home is spectacular. This is the second year we rented during the holidays to be close to family. The home is clean, has all the conveniences of being at home, super location and views and just perfect in every way! We would love to find a way to stay for a summer week. I highly recommend this home and so appreciate being able to stay there. Fun and a Great stay!! Clean and had everything we needed! Quaint, but updated 1830's beauty! My wife, son, and I decided to experience New England first hand. We are so glad we chose this 1830's updated farmhouse. The VRBO experience and Tim Pearl in particular made our trip both memorable and satisfying. We used the house located right on Lake Champlain as our base of operations to explore the region (Lake Placid, Burlington, Ticoderoga, Montreal, Stowe just to name a few). It was an ideal location from which to base our exploration of the area. I can see why Tim (who grew up just down the road) decided to buy a place here. The region is absolutely gorgeous and is now one of our favorite areas in the US. I highly recommend this house. It was worth the expense . . . So glad you loved the area and the house! We’d love to have you back! We had a great stay. Lovely home in a beautiful location. What a great view of Lake Champlain to wake up to. Owners were very nice to work with. The big modern kitchen was well equipped and lots of outdoor space to gather with the deck and patio. Bedrooms are spacious. Great location for us as we had a wedding reception at the Valcour boathouse. Our daughter enjoyed the paddleboat. Thank you for a lovely and memorable stay! Thank you so much! We are so happy you had a wonderful time! Thanks so much! We’re very happy you had such a good time! Thank you so much! We’re so happy you enjoyed your stay! Enjoy a dream vacation at possibly the most idyllic spot anyone could ever imagine! Oyster Haven is a renovated circa 1830 farmhouse that combines vintage charm with all the modern conveniences, including a state-of-the-art gourmet kitchen with two ovens and an enormous central island perfect for large family gatherings. 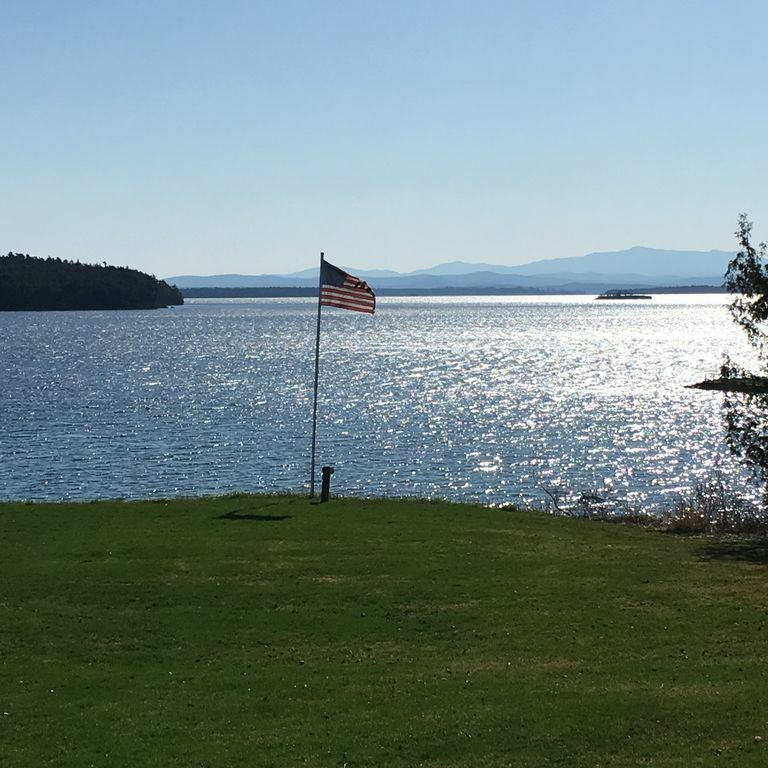 Located on the shore of Lake Champlain, this immaculate and comfortable vacation home boasts an acre and a half of property that includes a deck, a large patio with a fire pit, and a grassy yard that stretches down to a private beach. With 250 feet of lake frontage, a dock, three kayaks, a canoe, a stand-up paddle board, and a mooring for those who wish to bring or rent a motorboat or sailboat, guests can find a whole host of outdoor activities without ever leaving the back yard. This property is located right next door to the Valcour Conference Center, which is an events venue specializing in wedding receptions, business conventions, reunions, and much more. Scenic Au Sable Chasm is just a couple of miles down the road from the house. Forty minutes to the southwest is beautiful Lake Placid, home of the 1980 Winter Olympics and Whiteface Mountain, which boasts the best skiing east of the Rocky Mountains. For big city flavor, Montreal is just an hour to the north. You’d be hard-pressed to find a vacation home that offers so many amenities for the comfort of its guests, as well as breathtaking lake and mountain views, countless outdoor activities (swimming, boating, fishing, and more! ), and plenty of tourist attractions close by. When you’re planning your next vacation, think about spending it at Oyster Haven! For Summer/Prime season, weeks will be from Saturday or Sunday to Saturday or Sunday (6 night minimum) unless special arrangements are made with owner. Check-in time is 4:00 p.m. Check-out time is 10:00a.m. Late check out will be charged $100 per hour 50% payment and signed rental contract upon booking lock in. 50% final payment and $1,000 refundable security damage deposit due at least 30 days prior to check-in date. Rental contract and answers to your questions will be set upon booking inquiry. We accept personal check, PayPal secure payments and payments through VRBO. Enjoy a great vacation on beautiful Lake Champlain.